Michigan ices the puck. 1-1 in shots, less than two minutes in. Malone just got nearly checked into the Michigan bench. Also, the fans are not super good at this whole white out thing. Berry covers a loose puck and its 0-0 four minutes in. Four and a half gone by in the first and we are still scoreless. Badgers up 3-1 on shots on goal in the early going. 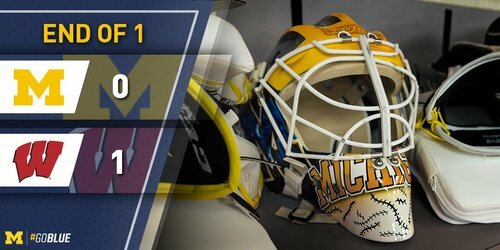 UW gets a whistle on a scramble in front of its net just before the puck comes loose and is knocked in by a Michigan player. Scoreless. LaFontaine got handcuffed by a Hughes dump-in from center ice and momentarily looked like he wasn't sure where the puck was. Michigan turnover leads to a good chance for Wagner, but he couldn't bury it. 0-0 with 12:43 remaining in the open stanza. LaFontaine holds onto a high shot by UW's Wagner. No score with 12:43 left in the first. Solid chance for Wagner showing some good patience but he is denied. Badgers and Wolverines still at 0-0 with 12:43 left in the first. 13:40 1st | Wolverines with a few early chances in the Badgers zone. Kunin dances his way in but can't sneak it past LaFontaine.
.@jack_lafontaine with a big save to preserve the scoreless tie midway through the first period. Michigan's Winborg shoots wide on a 2-on-1. 6-5 in shots for Wisconsin. 9:46 remaining in the first. 9:46 left in the first, UW and Michigan are scoreless. Shots on goal are 6-5 for the #Badgers . Puck is lifted into the Wolverine bench and there's a TV timeout. It's 0-0 with 9:46 to go in the stanza. UW leads SOG 6-5. Frederic with an easy one to put UW up 1-0. The goal came off the pegs just before but had come back down, or so it appeared. Goal counts. It's a good goal. Badgers up 1-0 with nine left in the first. #Badgers are 7-0 in @B1GHockey play this season when scoring the first goal. 9:07 1st | Frederic gives Wisconsin an early 1-0 lead. Michigan had UW pinned in its zone for a while. Berry forced to make 2 close saves but allowed rebounds. 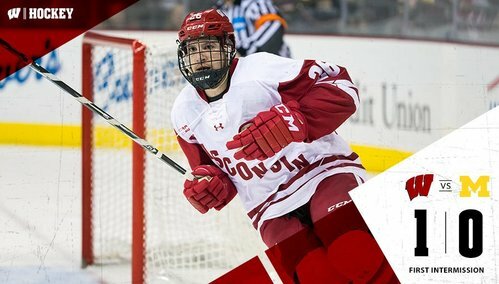 Wagner sends a pass across to Besse who gets tripped up and the Badgers will go on the power play. A 2-on-1 opportunity leads to UW's first power play of the game. 3:08 left in the period and the Badgers lead 1-0. Iffy call on Michigan's Boka for tripping on UW's Besse. Badgers get the game's first power play with 3:08 left in the first, leading 1-0. 3:08 1st | Luce heads to the box for tripping and U-M will head on the PK. Cavallini, Zimmer, Zirbel out for the last 24 seconds of the power play. Zirbel tries to take it to the net but gets denied. UW power play expires with nothing to show. One minute to go. Not a great PP for UW. Both teams back to full strength. 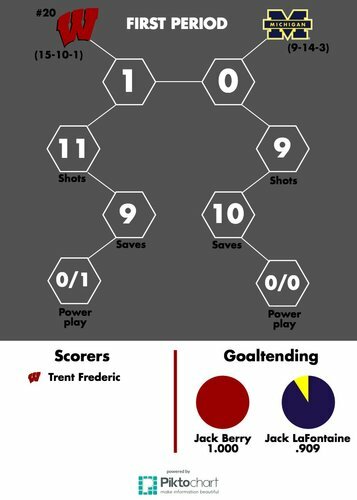 END 1: Wisconsin leads Michigan 1-0 on Trent Frederic's 11th goal of the season. Shots on goal 11-9 for UW. And now it's time for America's favorite intermission game, bubble hockey! Last time out, the white team dominated the red team. Team Red scores on a shot from way downtown, that was a beauty. Team Red saves a potential buzzer beater with a huge hit! What a thriller. Wisconsin with the early lead as we head into the first intermission. Badgers and Wolverines back out for the second period at the Kohl Center.